Work. Like it or not, it’s something many of us have to do outside of the home. This means we have to get dressed in an appropriate fashion for our work environment. Your work capsule wardrobe might vary depending on your office dress code or your age, but dressing professionally with style is a must in any office. Would you want to meet the CEO of your company in ripped skinny jeans? A business capsule wardrobe should make you stand out just enough to show your personality without being completely out of touch with the requirements of your responsibilities. Looking pulled-together and confident strengthens your profile at work, no matter what your job title. How do you want to look? To feel? One of the capsule wardrobe struggles readers write to us about most frequently is how to incorporate their work attire and their off-duty clothing into the same capsule wardrobe. This capsule framework offers a solution. While it won’t work for everyone to combine work and play clothing into the same capsule, it will work for many. (We highly advocate separate capsules for people in formal business environments like litigators or investment professionals.) Most offices have days when you can dress down a bit, like casual Fridays or days with no client meetings. However, most people still have trouble figuring out how to choose pieces that do double-duty. The first step is to consider how you want to look and feel at work and on the weekends. 1. Write down three words describing how you want to look at work. 2. Write down three words describing how you want to look outside of work. 3. Write down how you want to feel at work in your clothing. 4. Write down how you want to feel outside of work in your clothing. 5. Make note of any overlapping words. Your capsule wardrobe style isn't guided by specific pieces but by the goals you want to achieve with your clothing and outfits. We'll work through what to do with these words below. Now it’s time for the fun stuff! You know your overall goals for the capsule, but how do you select all of your pieces? If you haven’t read our post Capsule Wardrobes Made Easy, please have a look now. It will really help you understand the approach to take for your business capsule wardrobe! OK, have you read it? Great. Wait, no?! Seriously, go read it and come back here. We’re going to dive into the template more deeply with an eye towards the professional capsule wardrobe. OK, let’s take a closer look at this sample work capsule wardrobe. All work-focused pieces. Sure, you should also be able to wear them outside of work but as you select these pieces think of your work environment. You should feel amazing in these pieces and they should have that extra “wow” factor you need to make a great impression. 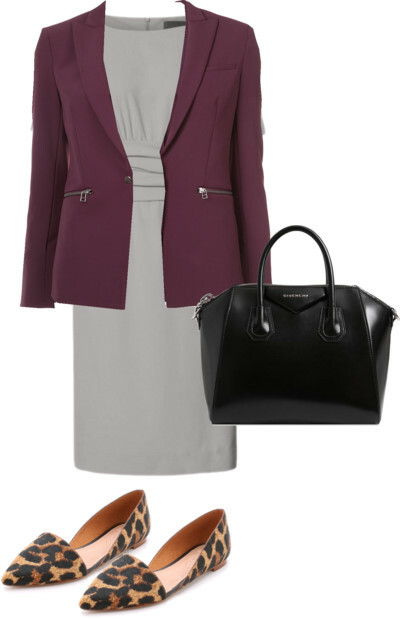 These are the pieces you wear when you need to exude confidence, even if you’re worried about that presentation to a new potential client or have a performance review with your boss. These should also be work-focused pieces. The five pieces you rely on week after week to get out the door looking great and feeling confident. These may be a bit more subtle than the first five pieces, but the color and cut of each should really flatter you. You can think of these as elevated basics that go with pretty much everything and are high quality. Layers are key, as they can make or break an outfit! Think about how often you wear layers while at work for aesthetic versus for warmth. If you need to wear suit jackets multiple times per week, your layers may skew more towards work than weekend. However, if you can wear sweaters at the office make sure to have a good mix of work and weekend possibilities. Too often we have a fantastic outfit created but don’t have a great outerwear option to keep us warm which also layers well over sweaters or blazers. Be smart about your layering options - don’t throw them in haphazardly. When the weather is super hot or terribly cold outside, the temperatures inside often swings in the opposite direction. Make sure your base outfit works for you for the temperature inside your office. Add or remove layers as you head outdoors. OK, these are the pieces that really help you mix your work and weekend wardrobe. You should be comfortable wearing them to work and to play, making them function-appropriate depending on what you match them with. More casual pieces like tanks and tees work well layered under other tops, sweaters, and blazers while at work but can stand alone over the weekend. Colors here should be your favorite neutrals, solids, and subtle prints. At least 5 pairs of shoes, 3 bags, and a couple key accessories. In this sample, the shoes are all office appropriate with a few that can be worn over the weekend. Feel free to swap or add in more casual shoes. You need at least one great work bag, one cool weekend bag, and a handy clutch that looks polished at work but chic on the weekends. We chose two belts for this capsule wardrobe to add an extra professional element, but you could also choose a special scarf or a signature watch. Although we did not intentionally choose a color palette when creating the capsule, you’ll notice that all of the colors work together. Many of the pieces are neutrals: shades of grey, white, black, and navy. Variations of green, blush, and burgundy/wine round out the beautiful fall color palette. It’s ok if all of your clothes don’t coordinate in the same manner. You have to start somewhere! Make sure each item works with at least three others to make several different outfits. Defining your color palette for your wardrobe as a whole and for each season is an evolving process that takes a lot of investigation and patience. Do you see this approach working for your wardrobe? How do you mix and match your work and weekend cloths?